“Sudan,” the last male northern white rhino. Image posted by Make It Kenya on Flickr and shared via Public Domain. On March 19, 2018, wildlife conservationists mourned the death  of a 45-year-old northern white rhinoceros named Sudan , one of the last three remaining northern white rhinos on earth, and the only surviving male. Keepers at the Ol Pejeta Conservancy  in Kenya, where Sudan lived, euthanized the ailing rhino to end his age-related suffering. With Sudan's passing, there are only two remaining northern white rhinos left in the world — both female and part of Sudan's bloodline — daughter Najin and granddaughter Fatu. Scientists now hope for the continuation of the species  via a controversial and highly debated in-vitro fertilization (IVF)  process. Researchers  have already produced successful hybrid embryos  using unfertilized eggs harvested from closely-related southern white rhino females, combined with the frozen sperm of deceased northern white rhino males. For the first time, the resulting embryos grew to the blastocyst stage  in the lab, filling scientists with the hope of saving the northern white rhino from extinction. Now, with Najin and Fatu under 24-hour guard in Kenya to protect them from poachers, scientists intend to harvest their eggs to create viable embryos with Sudan's frozen sperm and then implant them into female southern white rhinos (a closely related subspecies), to create the first “pure” IVF northern white rhino calves. At this point, however, the proposition is hypothetical: scientists have not yet been granted permission to extract eggs for the experimental process, but hope to receive clearance  from the Kenyan government before the end of 2018. As much as we're outraged about the loss of the last male white rhino #Sudan , I find it rather (whats the word?) that we want to raise US$9 million for IVF to raise a herd (which poachers willl find a way of killing) . Northern white rhinos (a subspecies of the white rhino ), used to roam parts of Uganda, Chad, Sudan, the Central African Republic, and the Democratic Republic of the Congo, but they are now extinct in the wild due to years of poaching and civil wars. Overall, rhino numbers — regardless of species — have dropped dramatically in recent years, primarily fueled by demand for their horns. In some Asian countries , people believe their horns can treat fevers and heart disease. In other areas, the horns are thought to symbolize wealth. 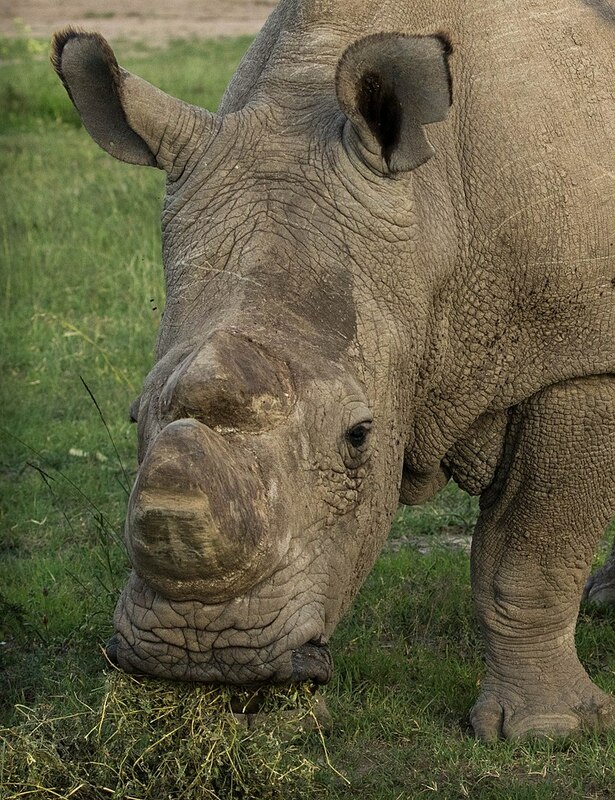 While the IVF debate continues, Sudan's death has raised awareness of the plight of rhinos throughout the African continent. Zimbabwe, for instance, is home to both the white rhino  and black rhino . In a 2009 rhino population count, there were approximately 425 black rhinos and 300 white rhinos roaming Zimbabwean national parks  and private conservancies . In an effort to stop the illegal killing and exploitation of wild animals, the Zimbabwean government has implemented legal protections for them, under provisions set out in the Parks & Wild Life Act [Chapter 20:14] (PWA),  which has strict consequences for offenses. A rhino is now classified as a “specially protected animal” — hunting and killing them is prohibited, and offenders face a mandatory jail sentence of nine years on a first conviction, and 11 years on a second. Even with a stiff penalty in place, poachers are still willing to take the risk but end up as pawns in a complex network  of organized crime. Many are poor, unemployed villagers, lured by the lucrative promise of poaching. Combating the illegal wildlife trade must (and often doesn't) involve the arrests of those organizing it at the top. The PWA demands forfeiture  of any equipment, vehicles or weapons used for committing wildlife offenses, giving the state the right to confiscate and dispose of them as it sees fit — but despite these legal protections, change is slow in coming, and limited by a lack of adequate funding, lax law enforcement, and corruption. A South African daily online newspaper, the Daily Maverick , reported that corruption is linked to illegal rhino horn trade not just in Zimbabwe, but in eight other African countries. Conservationists are urging activists and everyday citizens — especially those who reside in close proximity to the home ranges of wildlife — to take an active stance on rhino conservation. In Zimbabwe, where 62 percent of the population  is below the age of 25, the hope is that youth will play a central role in this activism thrust. However, as more young people spend increasing amounts of time online rather than out in nature, activists must focus heavily on youth recruitment in the fight to save rhinos. As an umbrella species,  rhinos are an integral part of a rich ecosystem whose daily habits directly impact the quality of life for other species. Their grazing, for instance, keeps the grass trim, making the terrain easier for smaller mammals to navigate. While scientists acknowledge that extinction is a natural part of evolution, the process is occurring at a much faster rate because of poaching, habitat destruction , over-exploitation of wildlife, and even political conflict . Rhino extinction will have a profound ripple effect on other species, and Sudan's death is a glaring reminder.